Bob Haney Rules Week rages on! Now in fabulous black and white! He's making a Spider-Man reference! My brain just exploded. Aww, look at him, bouncing around for no reason. Talking like a twelve-year-old. Remember when Batman used to smile? Like, really smile. To the point where it was very creepy? Do you think that's true? 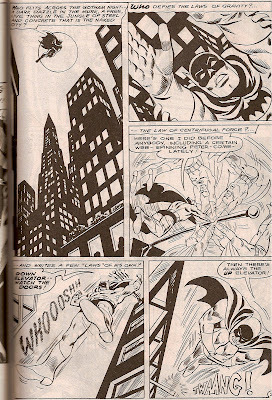 Do you believe that that moment remains Batman's most cherished honour? I think he's lying through his giant, creepy teeth. I don't mean to get distracted by the artwork when the focus is supposed to be on Haney's zany writing. 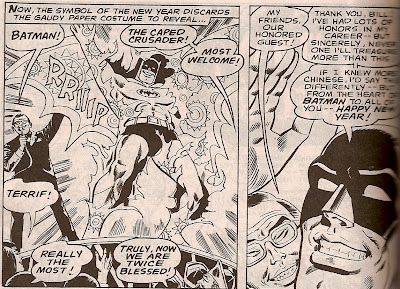 The creepy smiling is awesome, but really couldn't even happen if the storyline didn't make Batman the guest of honour at a Chinese New Year party. (Why? Because it's "The Year of the Bat." Uhhhh...sure. Why not? ).